Restores natural pH. Lactoserum. Gently cares & moisturises. Sensitive skin. Keeps skin healthy. Dermatologically tested. Sanex Dermo Sensitive bath cream is specifically developed for sensitive skin. It contains lactoserum, an ingredient rich in milk proteins to help leave your skin feeling comfortable & soft. Restores Natural pH Maintaining a healthy pH is essentially for your skin. 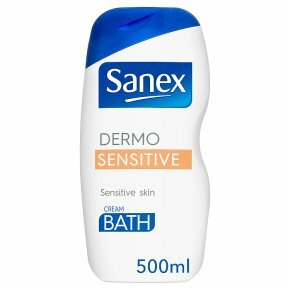 Sanex Dermo's unique formula actively works with your skin to help restore its own natural pH level. For healthy, moisturised, soft skin.